2014 is the year of role-playing…November marks the 10th anniversary of World of Warcraft, the first truly global online game, and in January gamers celebrated the 40th anniversary of Dungeons & Dragons, the fantasy game of elves and dwarves, heroes and villains, that changed the world. When Dungeons & Dragons (D&D) became popular in the late 1970s and early 1980s, many commentators lambasted the game as a gateway to amorality, witchcraft, Satanism, suicide, and murder. Of course, such accusations were no more substantive than the claim that vicious tricksters put needles in Halloween candy, and eventually everyone saw through them. In fact, the only thing that D&D’s detractors got right is that D&D competed against the conservative religions that attacked them. Those original D&D books were and remain sacred texts. Finding an out-of-print copy of Deities and Demigods was a religious experience in the 1980s. It was impossibly rare, appearing once a year behind the counter at the comic book shop and with a plastic bag protecting it from the mundane dust, dirt, and fingerprints that could sully its sacred value (and it’s high price). The magic of Unearthed Arcana could inspire the spirit, renewing a love of the game through new rules and new treasures. Like any good sacred text, the handbooks of D&D enthralled the players and gave them dreams worth dreaming. In doing so, they gave them opportunities to be more than anyone else had ever hoped. Dungeons & Dragons made heroes of us all. As the devoted fans of D&D grew up and, more often than not, gave up the game and its requisite all-night forays against evil, fueled by junk food, soda, or beer, they nevertheless carried it with them in their hearts and their minds. Dungeons and Dragons never changed people into Satanists and murderers, but it did change them. All of those years carrying a Player’s Handbook or a Dungeon Master’s Guide couldn’t help but reshape the bodies that lugged them around or the minds that fixated upon their contents. Those books encouraged adventure, and a desire to go one step further, even in the face of cataclysmic danger. Let the mysterious be understood, for there is always another mystery to uncover. Dungeons & Dragons was a revelation. It didn’t come—as far as we know—from any gods, but it revealed the future. Today more than 90% of high school students play videogames and the demographics just keep getting better for the manufacturers. Every time a new Marvel comics-themed movie hits the theaters, it goes radioactive, raking in many times over its enormous cost to film. The religions of Star Trek and Star Wars have played a part in this cultural turn, and they get most of the mainstream credit. But it was the subtler impact of D&D that really re-shaped the world. 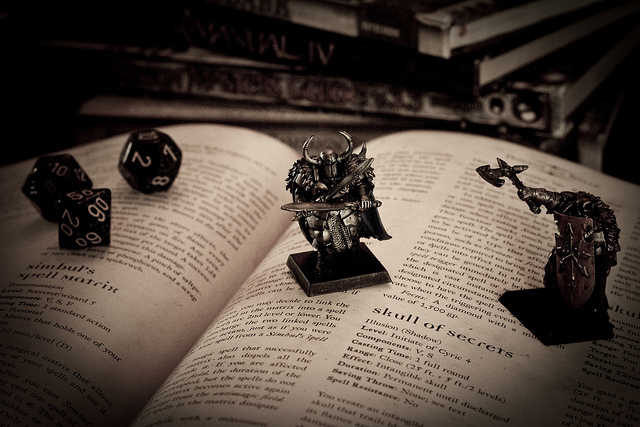 Dungeons & Dragons provided the intellectual and imaginative space that has produced many of today’s great writers, technology entrepreneurs, and even academics. The game is a game of imagination, and its players—whether they gave up when they graduated high school or college or whether they play now with their friends and their children—never forgot what it means to imagine a world. They’ve been re-imagining this one into their image of it and we should all be thankful for the opportunity to play in their world. Image credit: Dungeons and Dragons (meets Warhammer…) by Nomadic Lass. CC BY-SA 2.0 via Flickr. 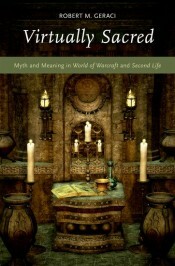 Robert M. Geraci is Professor in the Department of Religious Studies at Manhattan College. He was the principle investigator on a National Science Foundation grant to study virtual worlds and the recipient of a Fulbright-Nehru Senior Research Award (2012-2013), which allowed him to investigate the intersections of religion and technology at the Indian Institute of Science in Bangalore. He is the author of Apocalyptic AI: Visions of Heaven in Robotics, Artificial Intelligence, and Virtual Reality; Virtually Sacred: Myth and Meaning in World of Warcraft and Second Life; and many essays that analyze the ways in which human beings use technology to make the world meaningful. As a long time player of RPGs (and someone who’s actually considered successful in this society), I feel immensely fortunate to have participated early in this grand experiment. Couldn’t agree more with this article. So many of my talented friends’ occupations were fueled by those early imaginative forays into Greyhawk and beyond. I have been playing Dungeons & Dragons since 1974. I do have a lot of Satanic Panic stories but D & D has been and still is a big part of my life. It helped me to find my calling of ministry to the counter culture groups in society.